The Palestinian Authority has accused al-Jazeera TV of distortion, after it leaked documents purporting to show offers of major concessions to Israel. 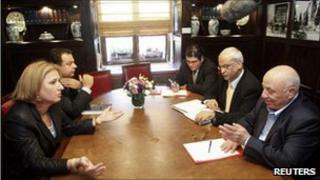 President Mahmoud Abbas said the leaks had deliberately confused Palestinian and Israeli negotiating positions. The documents suggest the Palestinians agreed to Israel annexing all but one settlement in occupied East Jerusalem - an offer Israel apparently rejected. The BBC has been unable to verify the documents independently. Al-Jazeera says it has more than 1,600 confidential records of meetings, e-mails, and communications between Palestinian, Israeli and US leaders covering the years 2000-2010. The Palestinians are reported to have proposed an international committee to take over Islamic and Jewish holy sites in Jerusalem, and limiting the number of returning refugees to 100,000 over 10 years. The papers are believed to have originated from the Palestinian side. Mr Abbas, who is due to hold talks on the peace process on Monday with Egyptian President Hosni Mubarak, said negotiations had been carried out openly, and his fellow Arab leaders were aware of their contents. Is it not strange that we would offer all these concessions which Israel demands, yet there is still no peace deal? "What is intended is a mix-up. I have seen them yesterday present things as Palestinian but they were Israeli... this is therefore intentional," he said in Cairo, in remarks quoted by the Reuters news agency. The chief Palestinian negotiator, Saeb Erekat, who is quoted as saying they were "offering the biggest Yerushalayim [Jerusalem in Hebrew] in Jewish history", later told al-Jazeera that he had nothing to hide. "On several occasions I have said on al-Jazeera that we, the Palestinian Authority, would never give up any of our rights. If we did indeed offer Israel the Jewish and Armenian quarters of Jerusalem, and the biggest Yerushalayim as they claim, then why did Israel not sign a final status agreement?" he asked. "Is it not strange that we would offer all these concessions which Israel demands, yet there is still no peace deal?" BBC Middle East bureau chief Paul Danahar, in Jerusalem, says the most likely source of the leaks is a Palestinian rival who wants to damage Mr Abbas's leadership. He adds that the Palestinian leader has not been directly quoted in these documents so far, and being at arms length may allow him to distance himself from the fallout. The secretary-general of the Palestine Liberation Organisation (PLO), Yasser Abed Rabbo, alleged that al-Jazeera was engaged in "media games... to trick and mislead the simple citizen" and was working for a "certain political trend" - a reference to the Palestinian Islamist movement, Hamas, which controls Gaza. But a Hamas spokesman said the leaks revealed the "ugly face of the authority, and the level of its co-operation with the occupation". They show "the level of the Fatah authority's involvement in attempts to liquidate the Palestinian cause, particularly on the issue of Jerusalem and refugees, and its involvement against the resistance in the West Bank and Gaza Strip", Sami Abu Zuhri said, according to the AFP news agency. Current peace talks between Israel and the Palestinians have been suspended for months over Israel's refusal to stop building Jewish settlements on occupied Palestinian land. Among the leaked papers, the reported offers relating to East Jerusalem are the most controversial, as the issue has been a huge stumbling block in peace talks. Both Israelis and Palestinians claim Jerusalem as their capital. The Palestinian reaction is a testimony to the potential damage the contents of the leaked documents could do to the Palestinian Authority President Mahmoud Abbas, and to his team. Israelis often say they don't have a partner for peace. But the picture that emerges from an initial reading of some of the documents is that the Palestinians have tried very hard to make a deal - and that Israel is not nearly as anxious to make progress. Compromises have been discussed that many Palestinians would consider a sell-out. The PA will now have to convince them that it has acted in their interests, and that its approach is the best way to achieve independence. Anger at the humiliations handed out by their Israeli occupiers runs deep in Palestinians. For some, the contents of the documents will be another humiliation. They will be infuriated by the concessions that appear to have been offered in the talks - at least insofar as they are portrayed by the leaked documents. Israel has occupied the West Bank, including East Jerusalem, since 1967, establishing close to 500,000 Jews in more than 100 settlements. According to one of the documents published by al-Jazeera, in May 2008 Ahmed Qurei, the lead Palestinian negotiator at the time, proposed that Israel annex all Jewish settlements in East Jerusalem except Har Homa (Jabal Abu Ghneim), in a bid to reach a final deal. "This is the first time in history that we make such a proposition," he reportedly said, pointing out that this was a bigger concession than that made at Camp David talks in 2000. Palestinian Liberation Organisation (PLO) leaders also privately suggested swapping part of the flashpoint predominantly Arab East Jerusalem area of Sheikh Jarrah for land elsewhere, according to the leaks. In addition, Palestinian negotiators are said to have proposed an international committee to take over Jerusalem's Temple Mount/Haram al-Sharif, which houses the Dome of the Rock and al-Aqsa Mosque - Islam's third holiest site. And they were reported to be willing to discuss limiting the number of Palestinian refugees returning to 100,000 over 10 years. These highly-sensitive issues have previously been non-negotiable. Nevertheless, the Israelis apparently rejected the Palestinian concessions. But without confirming the veracity of the reports, Israeli government spokesman Mark Regev said the then Israeli Prime Minister Ehud Olmert had also made concessions which were rejected by the Palestinians. "He put an offer on the table which called for splitting Jerusalem, he put an offer on the table with territorial swaps which gave, practically, the Palestinians 100% of all territory, and they nevertheless refused him," he told BBC Radio 4's Today programme. "That's what Prime Minister Olmert has said publicly and that's what's published today in one of these purported documents." Also the reportedly curt dismissals by some US politicians of Palestinian pleas do not fit with the message of even-handedness that President Barack Obama tried to put across in his 2009 Cairo speech, says the BBC's Jonny Dymond in Washington. The Palestinian ambassador to the UK, Manuel Hassassian, said that if confirmed, the documents would show that "major concessions" had been offered. "But I think we need to see this in context," he told the BBC World Service's World Today programme. "What was Israel willing to give in return to these concessions? Nobody talks about the other side." The leaks also purport to show that Palestinian leaders were "privately tipped off" about Israel's 2008-2009 military offensive in Gaza, a claim Mr Abbas has denied in the past.